Here's the latest comic for Investing.com. 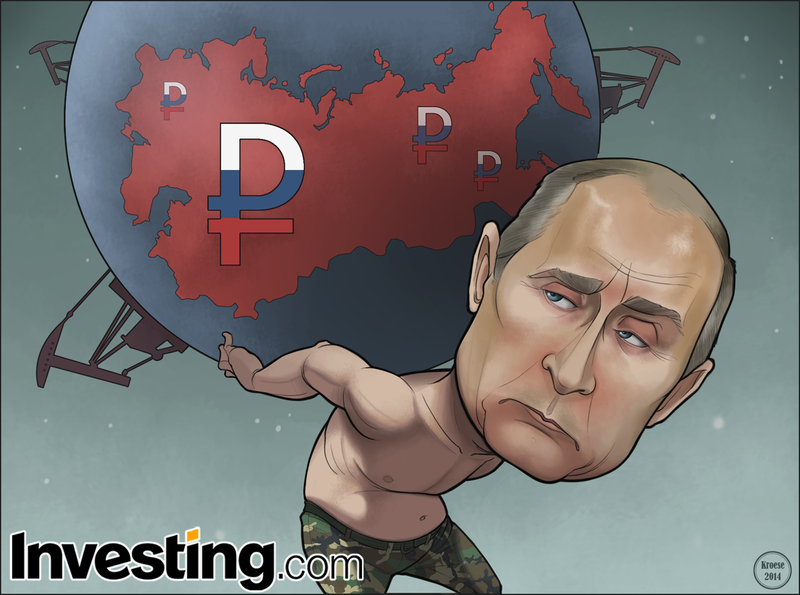 This week's topic is the continuing decline of the value of the rouble. More specifically, it's about the U.S. possibly lifting economic sanctions on Russia in order to lessen the strain on the Russian economy. John Kerry has already stated this as a possibility if Russia acts accordingly (namely, helping to ease tensions in Ukraine). 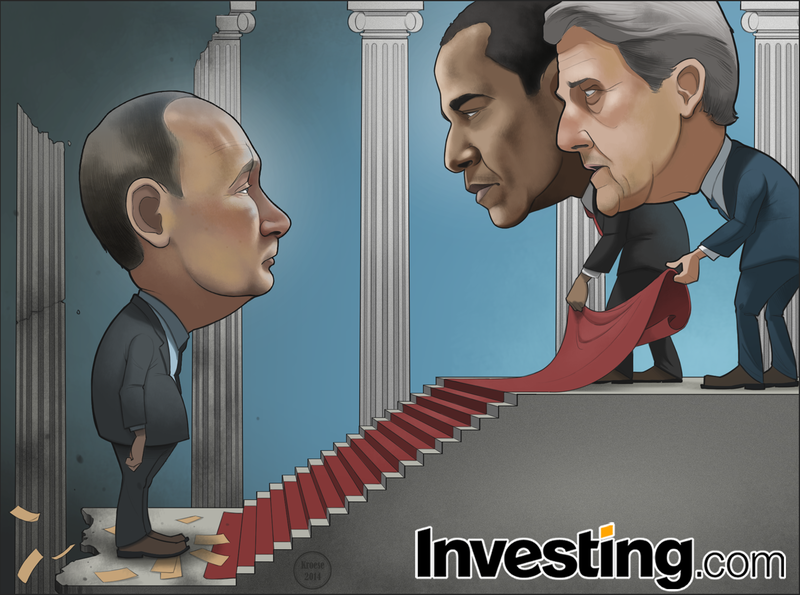 I was asked by the good folks at Investing.com to draw Barack Obama and John Kerry rolling out a red carpet for Vladimir Putin. 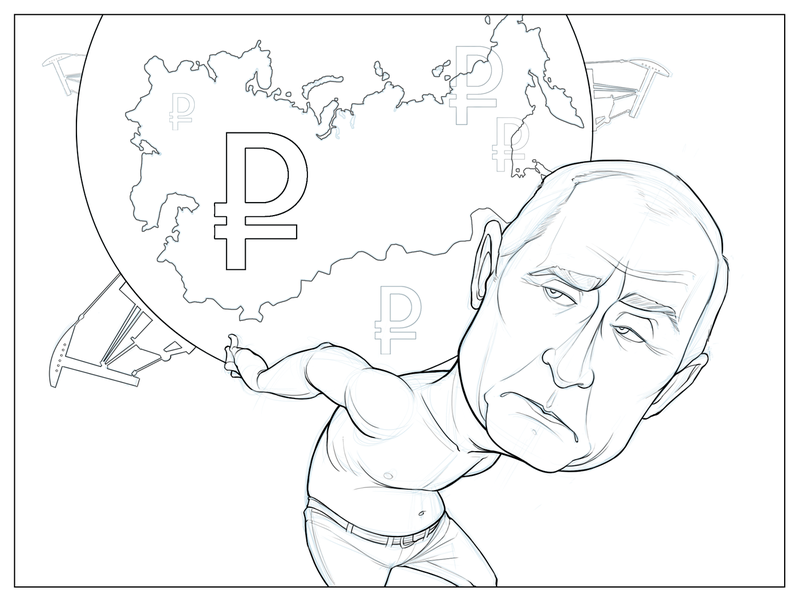 I was also asked to include some detail that illustrates Russia's economic turmoil. Because the setting is a metaphor, I wasn't exactly sure what kind of background to add. I ended up choosing columns because of their frequent cameos in the hallowed halls of politics (as well as ruined empires). The columns go from destroyed on the left side to pristine and bright on the right side, clumsily symbolizing economic improvement (not exactly a perfect metaphor, but I was thinking on the fly so cut me some slack). The two damaged columns are also angled in a way that theoretically draws the eye toward Putin. I'm not sure this was necessary, since viewers are going to look at him no matter what, but it was worth a shot. Furthering the suggestion of economic strife, I also made the color of the sky dark and foreboding on one side and bright on the other. Not to mention the fact that there are Roubles strewn on the ground at Putin's feet and the walkway behind him is crumbling. So I'd like to think I drove the point home adequately. Lastly, John Kerry has a great face to draw. Lots of character. Unlike his voice, which is droning and monotonous and pretty much without inflection or character of any kind. This is not to disparage the Secretary of State, who seems intensely smart, a savvy diplomat and consummate statesman. But the dude has a reeeally boring voice. This was an enjoyable comic to draw and I think it turned out pretty well. Here's this week's comic for Investing.com. 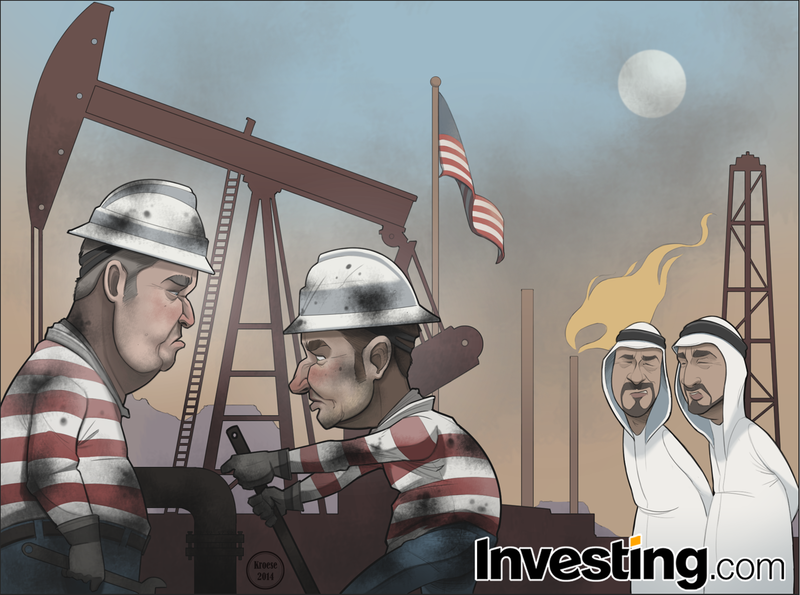 The topic this time around is plummeting oil prices. 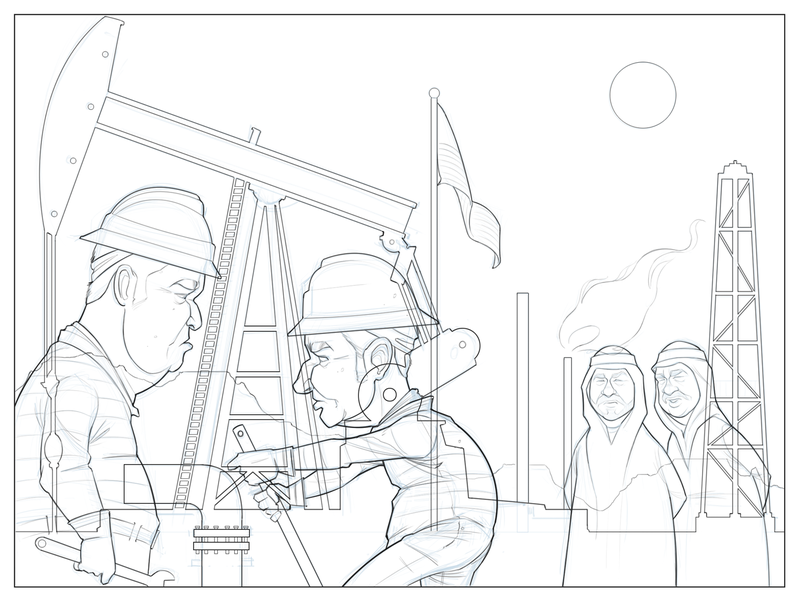 I was asked by the crew at Investing.com to draw an oil field. 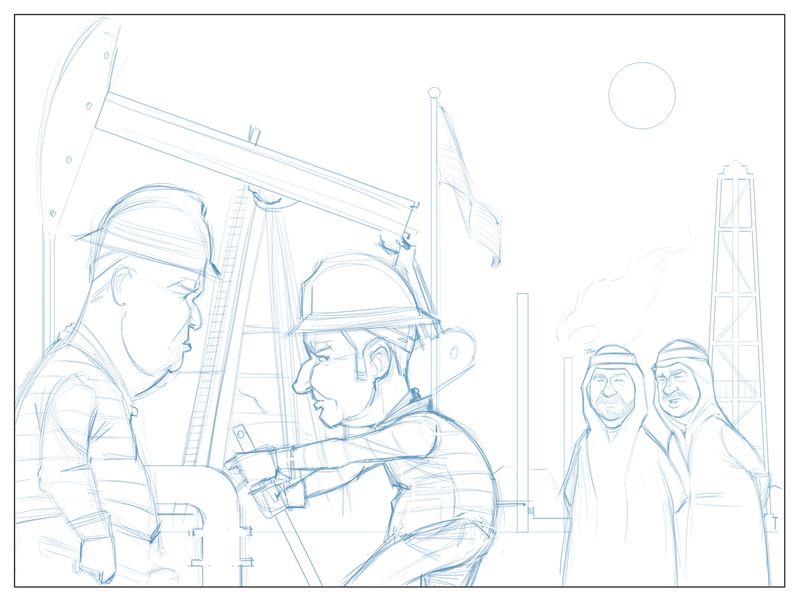 In the oil field, I was asked to draw two workers, you know...working. Nearby, they asked me to draw two sheiks whispering conspiratorially. They also asked me to include an American flag in the background and to have the workers' uniforms be red, white and blue to emphasize that this is supposed to be an American oil field. This comic was fun, but a bit exhausting. Yeah, I know: I draw pictures for a living. I've made hotdogs and shoveled ditches and cleaned movie theaters, so in the grand scheme of things, this job is the best I've ever had. But it can still be tiring. I spent around 11 hours on this comic, but I think it was worth it. I knew from the start that I wanted to make the sky hazy and maybe a bit dystopian. Or at least hazy like those days when it's slightly overcast or there's enough of dirt or smoke in the air that you can look directly at the sun and it's just a little white disk. I also knew it would be fun to draw the workers covered in oil. Dirty things and people are just more fun for me to draw. I love grime. It's fun. The workers are, in fact, dressed in red, white and blue, but they ended up looking like Waldo's rougher, working-class relatives. Waldo was clearly raised in more affluent circumstances. He spends his time just wandering around the world checking things out. 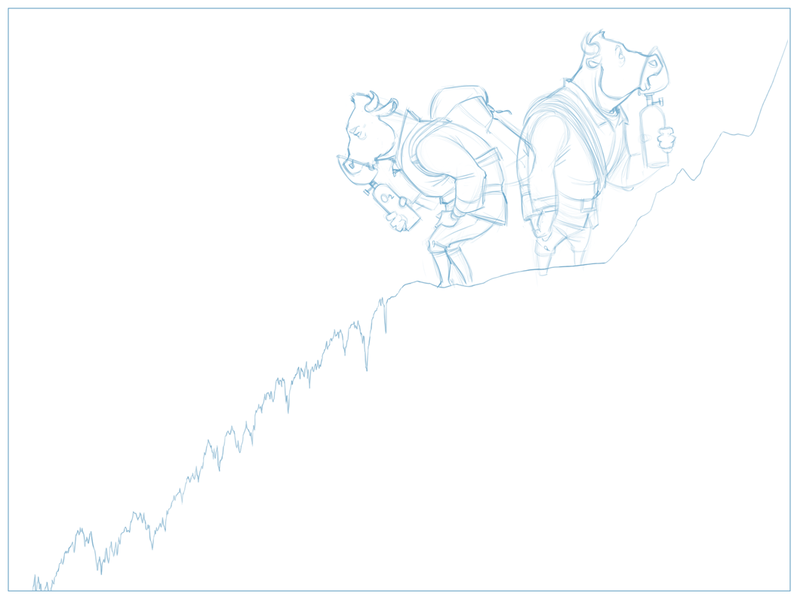 The sharp-eyed among you may have noticed the sheiks changed from the outline to the color version. I had reached hour 10 or so and realized I didn't like the original sheiks. I just didn't think they were well drawn. I considered leaving them in because I was tired and just wasn't up for drawing them again. But that little voice in my head (I think I'll name him Oscar Charles Durning) wouldn't let me. I knew I wouldn't be satisfied until they looked acceptable. So I started them again. I'm glad I did, but I'm not sure anyone would have noticed. At any rate, this week's battle has been fought and now I'm spent. Until next week. Here's the latest comic for Investing.com. This week's subject is the plummeting value of the Russian ruble due to collapsing oil prices (the Russian economy is heavily based on oil exports). At one point (according to the BBC), the ruble lost nearly 9%. 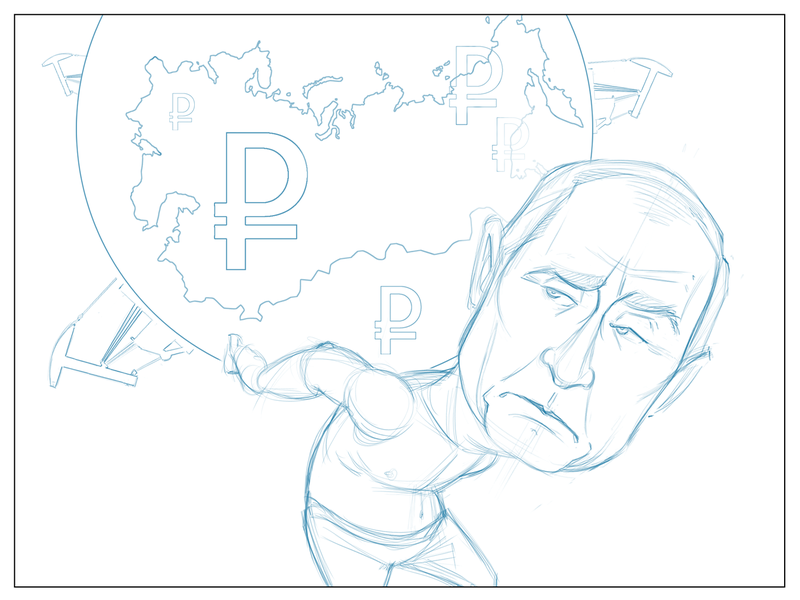 I was asked by the crew at Investing.com to draw Vladimir Putin as Atlas, holding a globe that represents Russia. They also asked that the globe have ruble symbols and oil rigs on it. Before I was given the subject of this week's comic, I was hoping to have something a little different on which to work. Specifically, I was hoping to be able to draw someone I haven't drawn for a while (or possibly ever) and someone with an interesting face. It's like the illustration gods heard my prayer and answered it (I'm not sure who those gods are, exactly. Al Dorne, Frank Frazetta and Rien Poortvliet?). 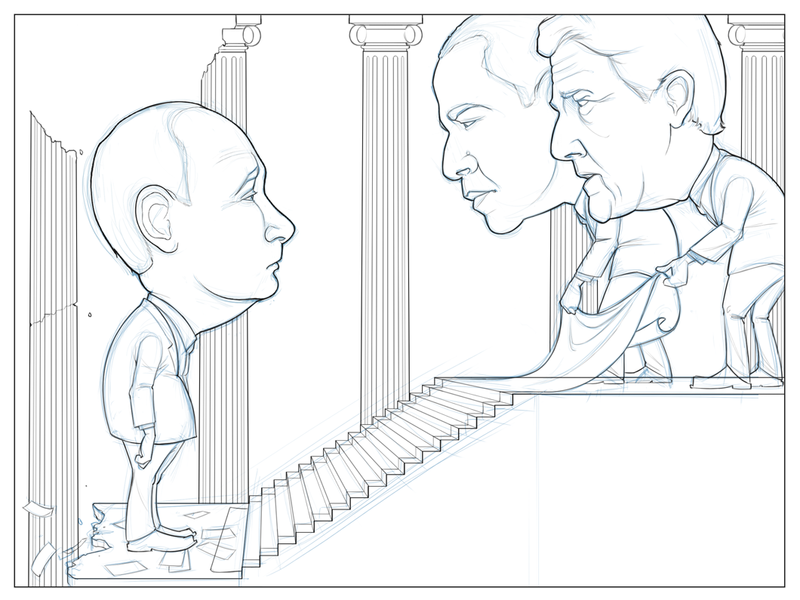 Because I love drawing Vladimir Putin. Putin has the greatest face for visual jokes. The proportions of his face are perfect for caricature. He's pretty much constantly frowning and seems to have little or no sense of humor. And his eyes seem to be permanently half-lidded in unflappable disaffectedness. Add to that the Greek god reference and the fact that this one was a single-character comic (which means I was able to spend a lot more time on details, shading, etc. ), and that equals all sorts of fun. This one was fun to think about, fun to draw, and I think it turned out fairly well ("fairly well" is about as high as the praise gets when I'm talking about my own work). So there you have it. 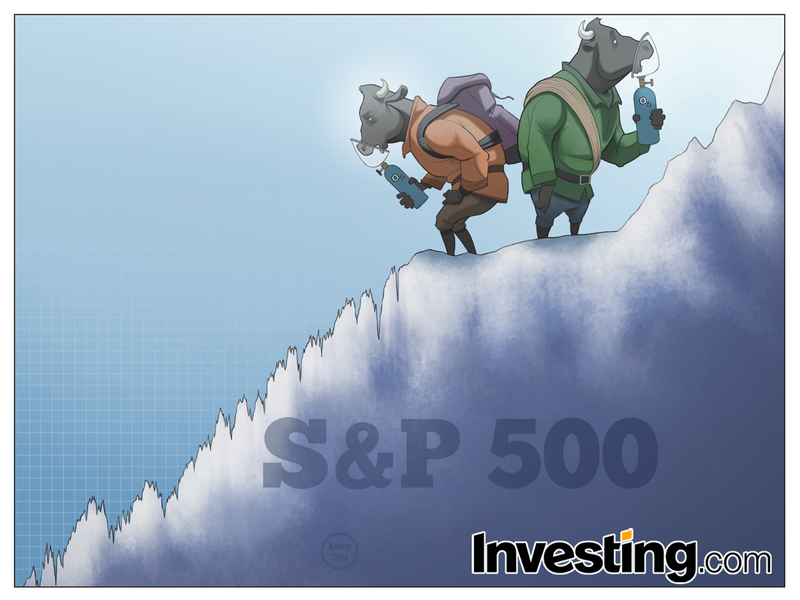 A great week for the Investing.com comic.